This summer is all about the old reinvented. Or, as I would like to call it – the summer 2017 phenomenon of “Retour au Retro”. Picture any trend you would like, whether it is from the ’60s, ’70s, ’80s, or ’90s… They are all back, stronger than ever on the 2017 summer catwalks. Retro everything for summer 2017. This summer does a major leap back in time and reinvents every single époque or past fashion trend. But, with its own peculiar twist. The list of remixed trends is a long one. But, it certainly and undoubtedly defies your imagination – showing you to what extent fashion can be creative and old trends can be played with, revisited and result into new groundbreaking and original ones. Every single fashion related garment you can think of, from A to Z, has been reinvented for this summer. Eyewear, swimsuits, apparel, jewellery, purses… Anything and everything. Remember that flowery pattern hanging on your grandmother’s curtains? Well believe it or not, this piece of cloth that once made you cringe is now killing it on the fashion runways. Wallpaper style prints and florals are one trend that have dominated the summer 2017 season, and have definitely earned the right to be rehabilitated in all of our minds! The ’70s are revisited with the gypsy and bohemian trends. The English sleeves belonging to that era are also revisited and reinvented. Another era that summer 2017 taps into and draws inspiration from is the Victorian with the romantic Victorian touches such as frills, ruffles and lace. The ’80s disco glamour is back too. We’ve seen the flared pants, the glam and metallic wears. Not forgetting the sequins – in all their sparkling and shining splendour. The ’90s have made a return too. The bold power-suits. The shoulder pads The pop-art and sci-fi references. 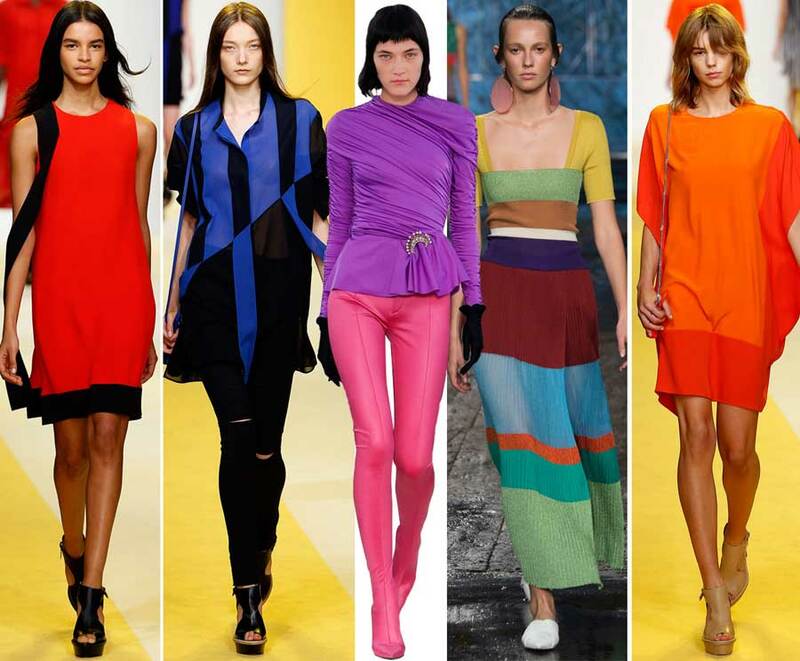 And, lets not forget the colour blocking and clashing. Oh, and of course, the everlasting ’90s love of denim. This must be fashion’s way of teaching us history and showing us how eras creep back up on us. To not only surprise us more with creativity and proving to us an that we live in an endless world of reinvention. Spoiler alert: In the upcoming articles we will go through all of these summer trends and show you how you can turn something like your grandmother’s old flowery curtains into a runway winner!